Please see opportunities below that our chapter has been made aware of for NH women in construction. Applications should be sent per the instructions on the letter and not directly to the NH NAWIC Chapter. Ongoing apprenticeship programs are listed first and then specific job openings are listed at the bottom. Thank you and good luck with your job search. **Please contact Meghan Theriault if you would like to post a job opening or apprenticeship program on the NH NAWIC website. 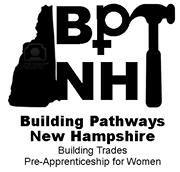 The program is designed for female New Hampshire residents who are unemployed or underemployed, who are physically able to work in construction, are 18 or older, are authorized to work in the US, have a high school diploma or GED, are drug free and agree to drug testing, are on time, are interested in a construction career, can pass an 8th grade level English and math test and who have access to reliable transportation. Women of color and female veterans are strongly encouraged to apply. Click Here for the most recent training flyer and fact sheet. Are you 18 years or older, under-employed or unemployed and looking for a pthway to a successful future? Then the Pre-apprenticeship Certificate Training-PACT Program is for you! Home Builders Institute (HBI) has partnered with NH Home Builders Association (NHHBA) to provide HBIPACT training to eligible persons. Graduates can earn a certificate that proves to employers that they have the construction skills needed to be successful on the job. This FREE training includes instruction in basic Carpentry, Electrical Wiring, Brick Masonry, Plumbing, Painting and Facilities Management as well as instruction in safty/first aid, construction math, career counseling/job placement assistance, tools/material identification and green building, hands on training in specially-designed workshops and opportunities to volunteer your skills on community construction projects. Great site which is run by NH Employment Security where you can search NH jobs by category, create a resume, get education and training information or explore your options for a new career. Site does require you to create a login to access all features.